When people are shopping for jewelry at Christmas and other holidays it is hard to know exactly what to get. The best idea when you are not sure where to turn is to come in to luxamart in frisco,TX and get advice from one of our friendly employees. Our staff has decades of experience in helping find the appropriate gift for any occasion. An informed consumer can make purchases much more intelligently than others. 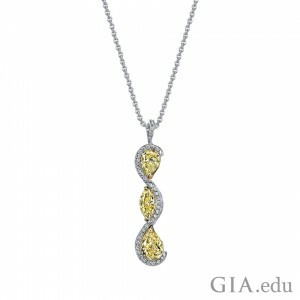 It is smart to pay attention to what type of jewelry the person you are shopping for likes. Do they like watches, necklaces, earrings? Talking with our staff will ensure that you are making the right decision when it comes to your purchase. Below I will share some ideas to help get you going. You want to look your best at every event, so take a few moments to plan ahead. We’ve collected some on-trend jewelry styles that we hope will inspire you as you put your holiday outfits together. And if you don’t have picture-perfect baubles like these in your jewelry box, well, there’s still time to drop a hint or two or three. What’s a holiday party without color? 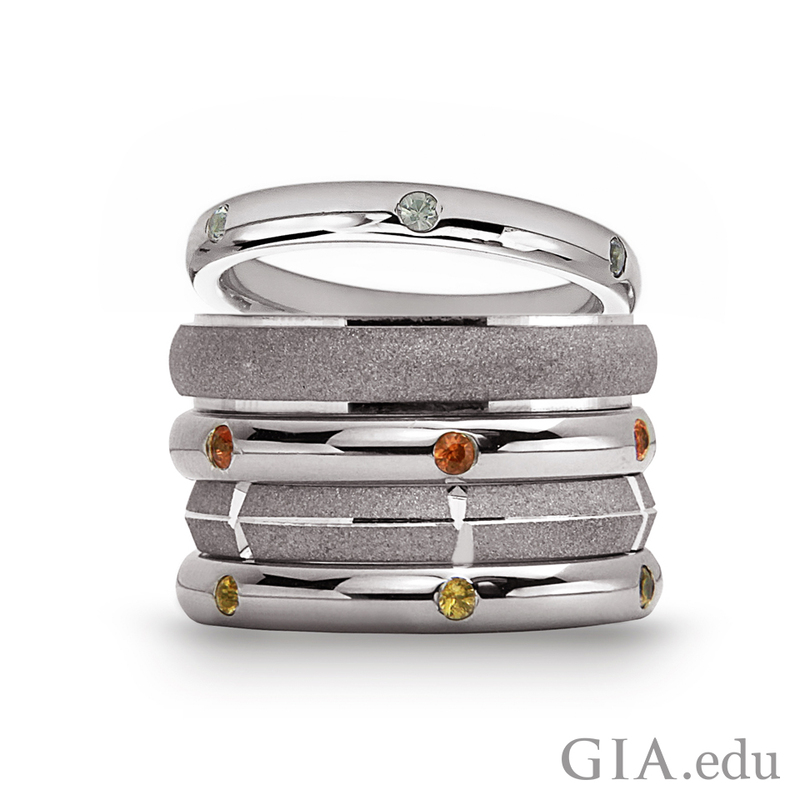 Build your holiday color palette with colored diamonds. 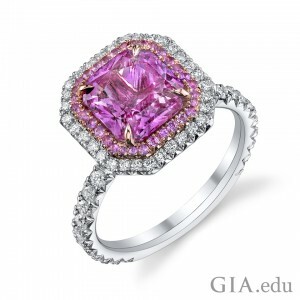 The beauty of colored diamonds is arguably unrivalled, as is their rarity. If you already own a piece of colored diamond jewelry, wear it for the utmost of special occasions– it’s meant to dazzle. And if you’re shopping for a colored diamond , consider asking for a Colored Diamond Grading Report to know exactly what you are buying. Be the belle of the ball with this diamond and sapphire platinum ring showcasing a 3.14 ct radiant cut pink sapphireset in 18K rose gold . Courtesy: Omi Privé. Colored diamonds aren’t within your budget? Don’t despair – there’s a beautiful rainbow of gems within your reach. 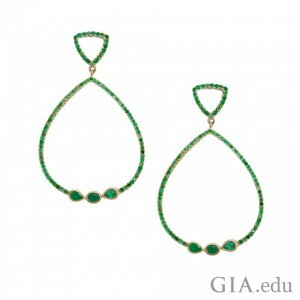 Colored gemstones are available in a wide range of colors and sizes, and they can be a budget-friendly alternative for incorporating colorful jewelry into your holiday look. While ruby, emerald, and sapphire jewelry are classics that never go out of style, consider pushing beyond the classics by choosing a gemstone that’s slightly off everyone’s radar. Rutilated quartz is colorless rock crystal quartz with inclusions of rutile, a mineral containing titanium dioxide. 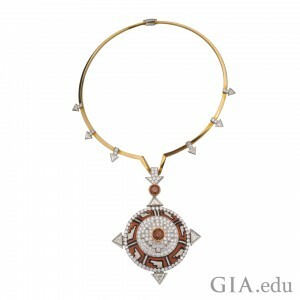 Each gemstone has a unique medley of inclusions of wispy needles, rods, and clusters. Yellowish orange, orangy red, and brown are some of the most common colors of rutile. Or choose Peruvian opal which comes in colors ranging from pale green to vivid blue. 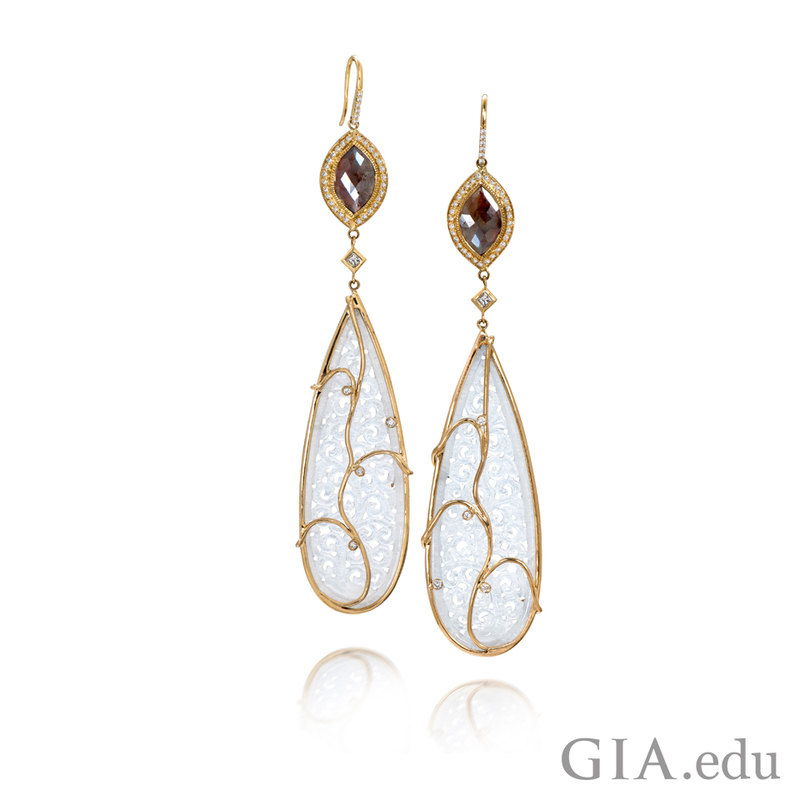 Mined high in the Andes, this opal has a rich body color, but no play-of-color like many opals. It’s arm candy! 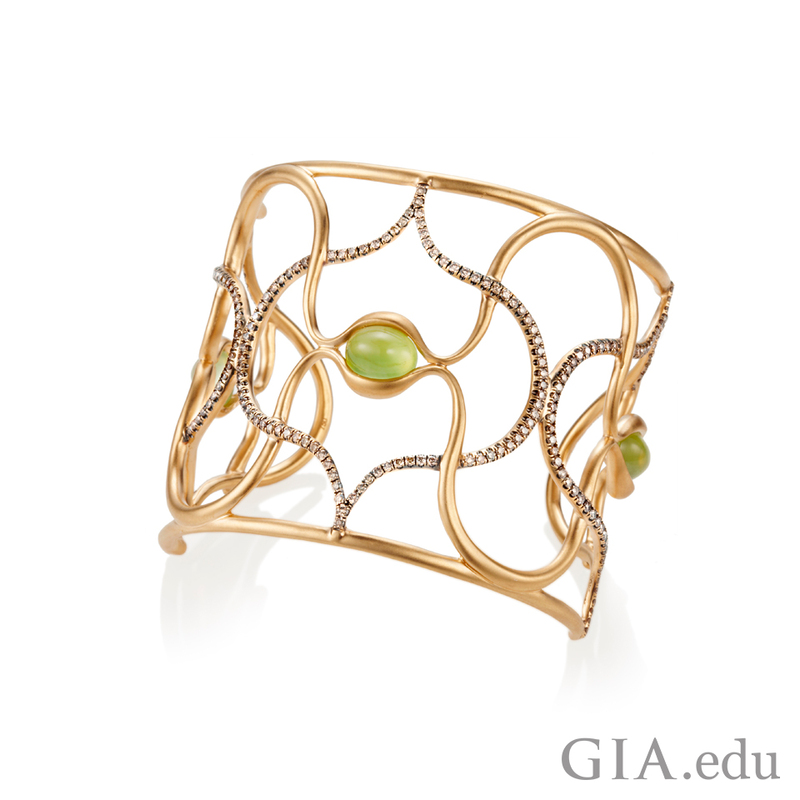 Anahita Jewelry‘s 18K gold cuff bracelet with pavé set brown diamonds, and prehnite cabochons weighing 10.27 carats total weight. Photo: David Weiss. Courtesy: Anahita Jewelry. What about a prehnite cabochon? This silicate is usually light green to yellow-green in color, with a misty, dream-like quality. Hot gemstones like these will not only add much needed color to your little black dress (LBD), but are sure to get the conversation going at any holiday event. 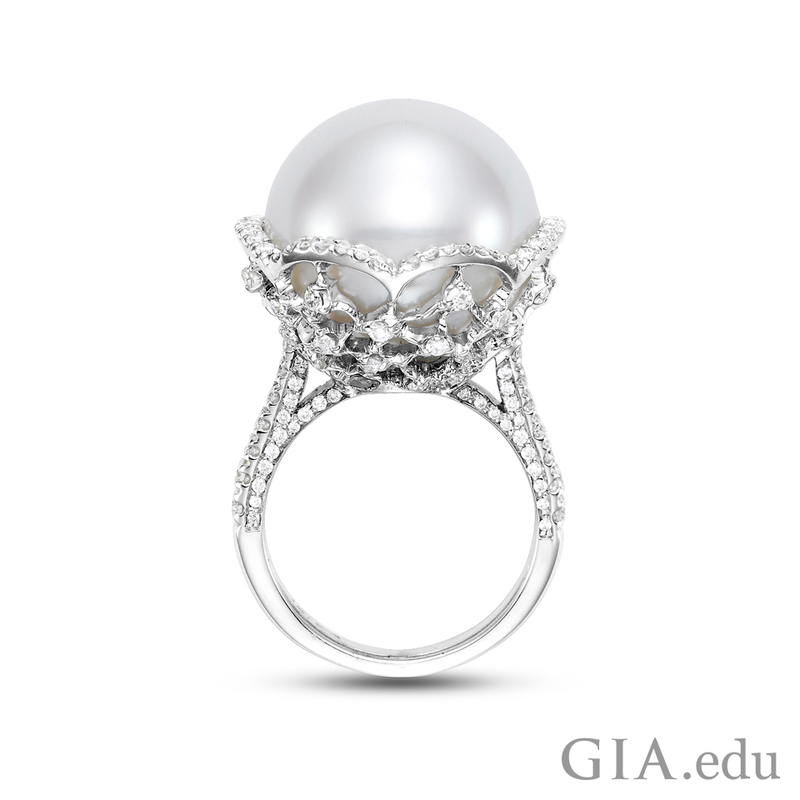 Have you put your pearls away for the winter? It’s time to bring these stunners out of the shadows. These well-loved organic gems are back in the spotlight, thanks to Fall/Winter Fashion Week 2015/2016 which featured fresh takes on pearl earrings and ear cuffs and long pearl necklaces that can be worn as short multi-strand necklaces, a la 1950’s Chanel. 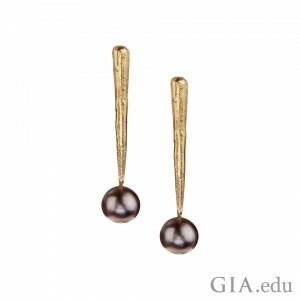 Whether you’re dressing for a quiet dinner with friends or large holiday party, pearls are a classic choice. If it’s been awhile since you’ve taken stock of your jewelry collection, now is a good time to start. If you’re looking to add to or freshen up your pearl wardrobe, make sure you have these 5 Pearl Essentials in your repertoire. Colorless diamonds are forever fashionable– but how they’re worn and styled changes with the times. For the big night out, bring some brilliance to your attire with a grand diamond cocktail ring. 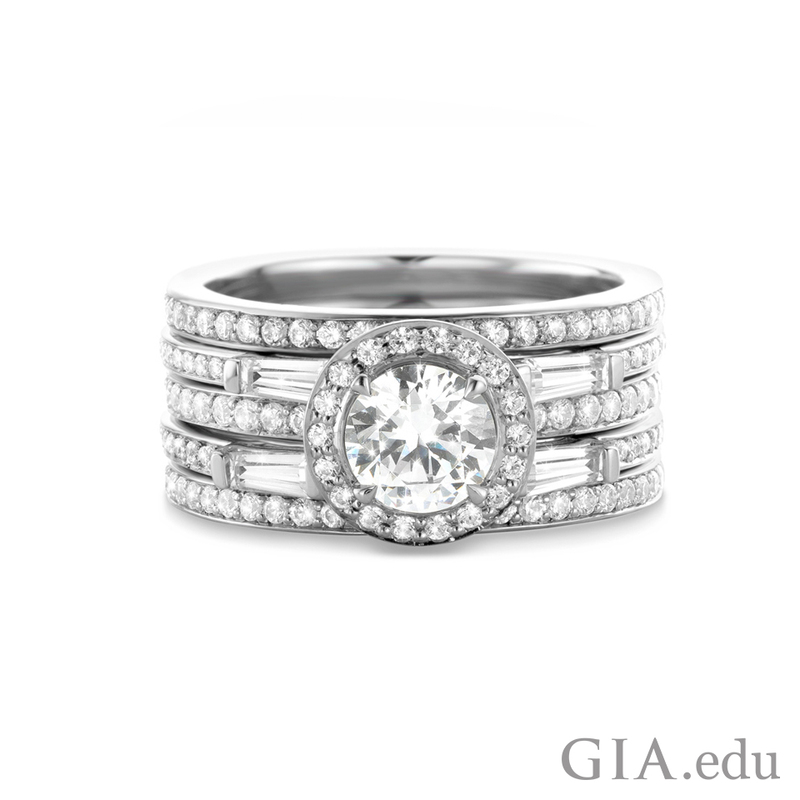 If a statement ring isn’t for you, minimalist pieces such as small pavé set ear cuffs, thin stacked bands, and small pendants with a solitaire diamond are on-trend ways to incorporate colorless diamonds into any of your holiday looks. 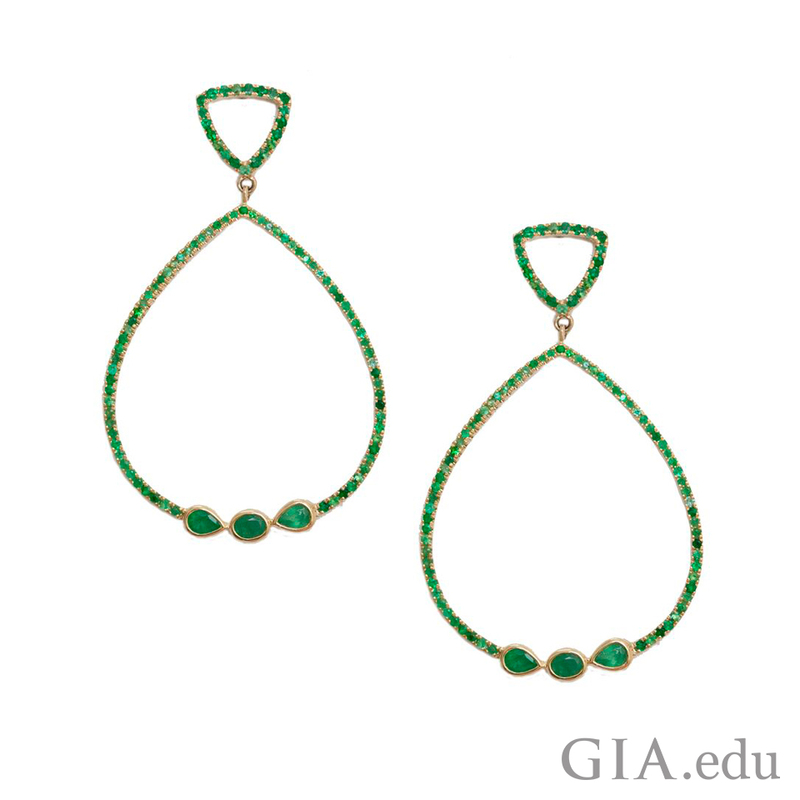 Emerald green is the perfect holiday color. Meredith Marks Tania Teardrop emerald earrings in 14K yellow gold. Courtesy: Jewelers of America. Nothing complements your go-to LBD better than statement earrings. Pair your black dress with different heels and jewelry and you’ll keep it looking fresh and new for the various events you’ll be attending over the holidays, without having to go on a shopping spree. Make a statement with statement earrings in jade and gold. Courtesy: Jewelers of America. Long airy hoops, shoulder-grazing tassel-like stunners or drop earrings – no matter the style, a beautiful set of statement earrings is a lovely addition to your outfit. The fashion savvy know that trends come and go, and then come back around again. That’s why we’re seeing so many collar and choker necklaces making a comeback. 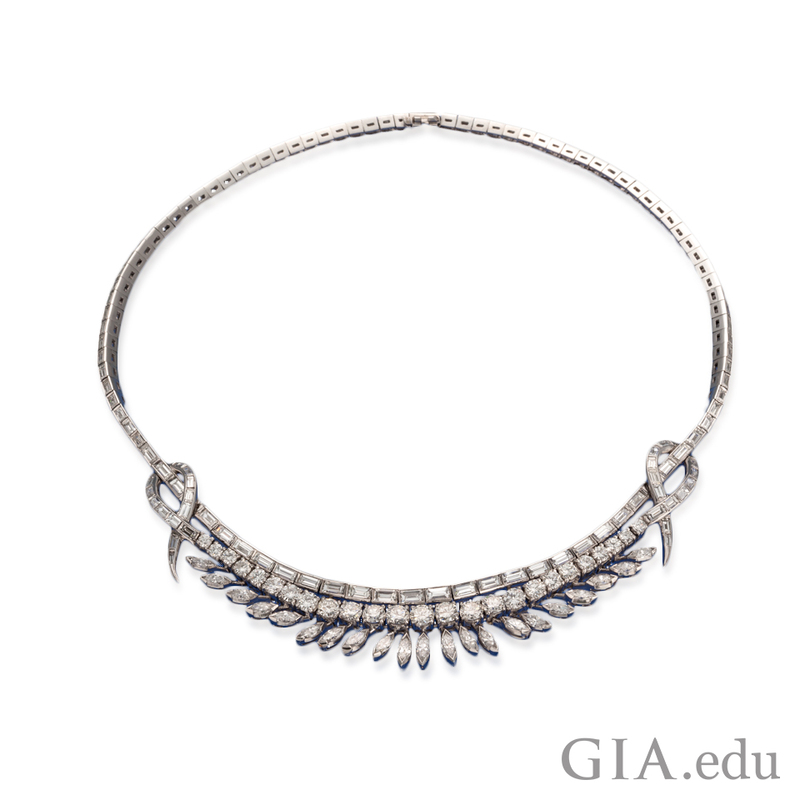 Popular in the conservative Victorian and Edwardian eras, chokers were reinvented during the second half of the 20th century. The diamond or pearl chokers popular in the 1950s evolved into beaded chokers on velvet or leather in the 1960s/70s, which became the dog collar style chokers during the grunge/punk ‘90s. Choker necklaces have been stylishly updated for today. Would you prefer a classic diamond and platinum choker, or a vintage statement piece like the yellow gold, platinum and diamond choker pictured here? Either way, make this trend your own by choosing one that reflects your style. Just like a perfectly tied bow on a thoughtfully wrapped gift, a bracelet can be the perfect way to finish off your holiday look. Traditionally a loop of material that circles the wrist, over time there have been many styles of bracelets like the cuff bracelet. Bracelets are available in such a wide variety of styles and metals – there is definitely one that will complement your look. 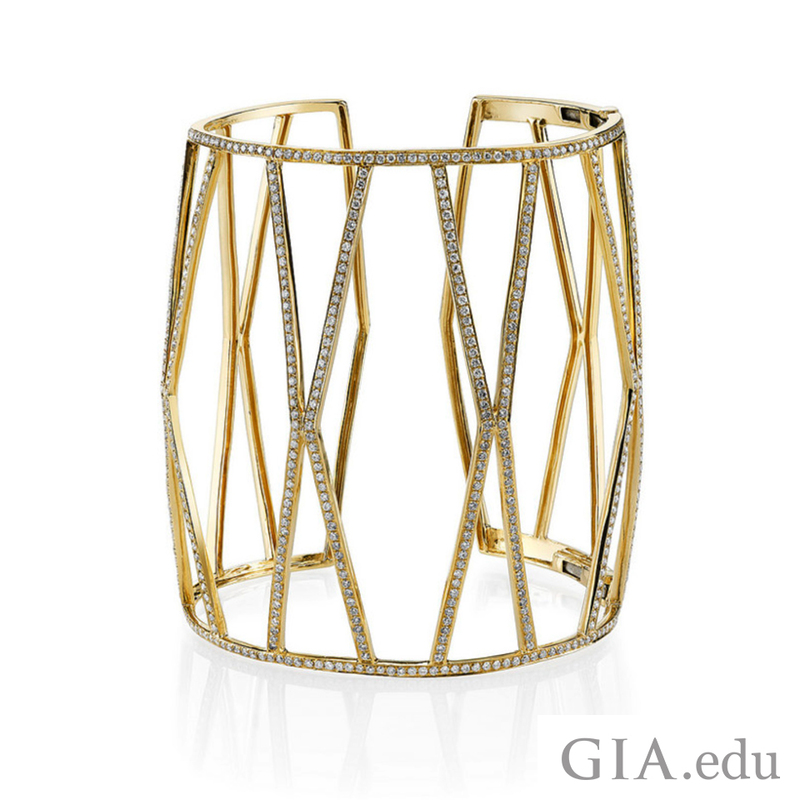 The stunning simplicity of a gold and diamond cuff works to dress up jeans and heels in the day, and pairs nicely with cocktail attire in the evening. 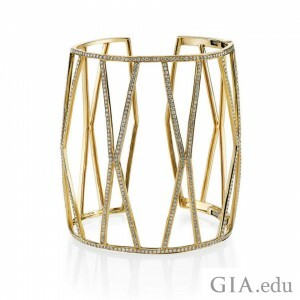 Consider adding a cuff bracelet to your collection this season. Why wear only one ring when you can wear three (or more)! While large diamonds and gemstones will always have a place in our hearts, slender rings, with or without gemstones, stacked together is a great look. 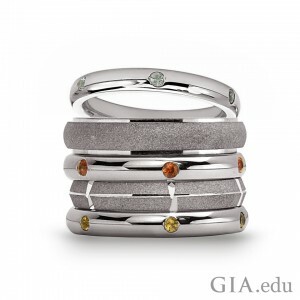 Mix and match metals, gemstones, and designs to match your personality. If your preference is gold then you’re in luck! 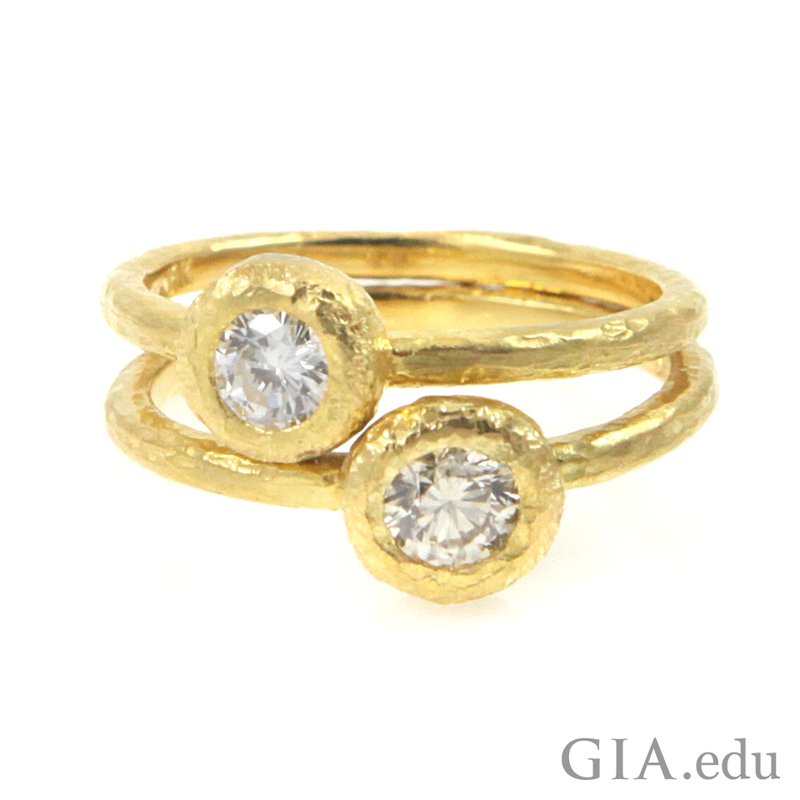 Yellow gold is back and better than ever. 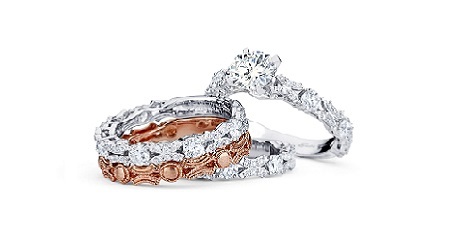 Mix it with rose gold for contemporary look, or pair it with the classic look of platinum. Have fun selecting the perfect holiday jewelry this season. Come in to luxamart today for the greatest value for your holiday jewelry needs! 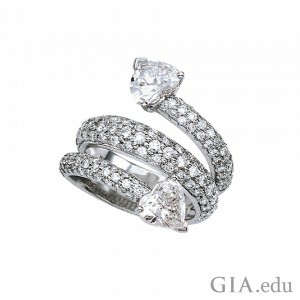 We buy, sell and repair and clean diamond rings, gold, silver, platinum and coins to help with investment. We also sell and buy and repair luxury watches including Invicta, Engagement rings, necklaces and much more. We are located in booming frisco, TX at Lebanon and Preston Rd.